For years, one of my favorite salads ever was the Costco kale salad kit. You know the one I’m talking about – plenty of kale, loads of superfood greens, dried cranberries, pumpkin seeds, and sweet poppy seed dressing. When I realized how much sugar it contains, I came up with my own (new and improved!) version. 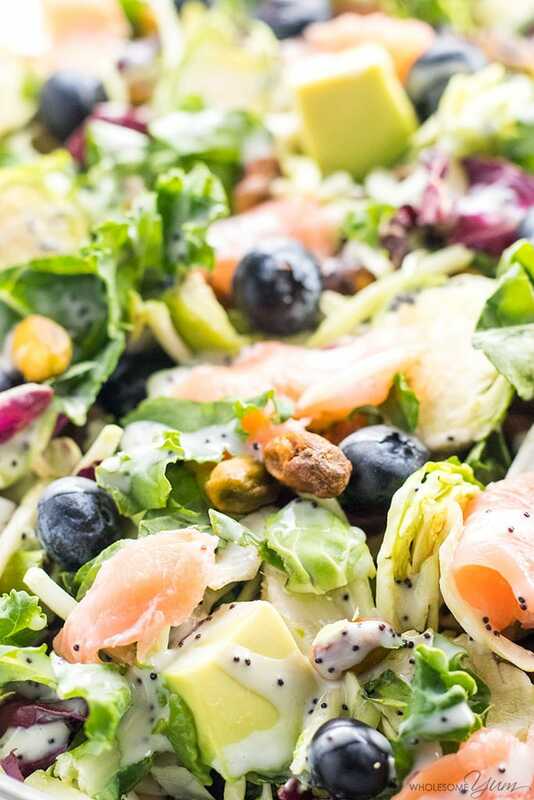 You guys, you have to make this smoked salmon kale superfood salad recipe! It’s even better than the original. I hate to disappoint, but I have my reasons! I’m actually leaving for vacation for the first time in two years this Wednesday. It’s been a long time coming – I have barely taken any time off since Wholesome Yum began in 2015. And let’s just say that, between all the holiday cookies and treats, I’ve needed something lighter. So, even if you’ve got cookies on the brain right now, I wanted to leave you with a detox superfood salad. That way, you’ll have something delicious and healthy to enjoy next week, when you’re ready to start thinking about the New Year. If you want to know how to make Costco kale salad the original (pre-packaged) way, there’s not much to do. Dump everything into a bowl and mix. 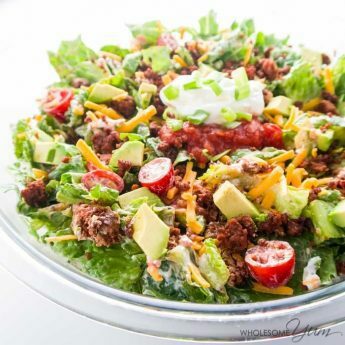 Fortunately, making a healthier, low carb version of Costco kale salad is almost just as easy. Almost! Now, don’t get me wrong – there are plenty of good things about the bagged sweet kale salad mix. It contains lots of really great veggies. I really do love it. But, there are some issues with it. The biggest problem is the poppy seed kale salad dressing. 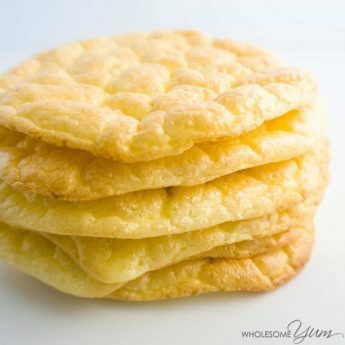 The top two ingredients are soybean oil and sugar! Fortunately, at least there’s nothing artificial. Still, I try to avoid soy due to its estrogenic effects. It has been shown to disrupt the endocrine system (source), and the vast majority is GMO. The sugar content definitely adds up, too. Besides, the fruit and seed mix is not the best. First of all, the super-sweet dried cranberries are also high in sugar. I swapped them with fresh blueberries instead, but if you really want cranberries, you could use homemade sugar-free dried cranberries like these instead. The pumpkin seeds in the Costco salad mix are roasted in canola oil, which is almost always GMO (source). This highly processed oil is partially hydrogenated, which translates to trans fats, inflammation, and calcification of the arteries. These are known risk factors for coronary heart disease, but companies get away with listing “zero trans fat” if the amount per serving is less than 0.5 grams (source). Fortunately, the greens in the sweet kale salad mix are fantastic. You do pay for the convenience, though, so it’s easy enough to make your own if you want to. Simply mix together some kale, green cabbage, broccoli, Brussels sprouts, and chicory. Of course, the packaging doesn’t list the exact amounts of each, but it really doesn’t matter. 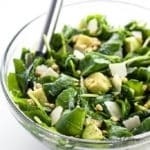 If you prefer to assemble the greens yourself for this superfood salad recipe, feel free to include as much or as little of each as you like! Okay, so we’ve talked about the issues with the dressing that comes in the Costco kale salad kit. Soy, GMO’s, and sugar… no, thanks. Why put up with all that, when making your own takes just a couple of minutes? Since lemon and kale pair so perfectly together, I incorporated that flavor. You’re going to love my easy, creamy lemon dressing in your kale superfood salad. The creamy lemon dressing for sweet kale salad needs just five ingredients. They are common ones, too! 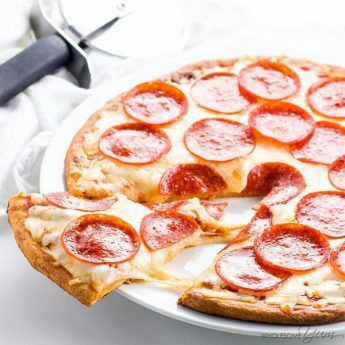 All you need is mayonnaise, olive oil, lemon juice, garlic powder, and your favorite sweetener. To keep away from soy, I like paleo mayonnaise made with avocado oil. For the sweetener, you can use whatever you like. I use powdered erythritol to keep it sugar-free. You can even use a liquid sweetener if you prefer that. Maple syrup or honey are both great paleo options. Granulated sweeteners might be a little grainy in a dressing, so just keep that in mind. I do love poppy seed dressing, so I kept with that theme and included poppy seeds. Those are optional, so it’s up to you if you want them or not. They make this simple kale salad dressing very similar to the one that comes in the packaged kit. The difference is no sugar or soy, and a subtle lemon flavor. 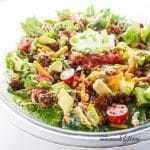 Who doesn’t love a lemon poppy seed dressing? How do you make sweet kale superfood salad that’s even better than the original Costco kale salad? It’s easy. Five ingredients in the salad, five in the dressing, and you’re done! Oh, and did I mention it literally takes five minutes to make, too? Doesn’t get any better than that. If you’re feeling lazy (or more likely, busy!) like me, grab a bag of Costco kale salad mix. Set aside the bag of extras inside for another use, or toss it. As mentioned before, I really don’t recommend the add-ins for anything because the ingredients are not the best, but it’s your call. Alternatively, gather your own sweet kale brussel sprout salad mix. I described how to do that above. It’s simple to do, just a little more time to chop and combine everything. The upside is, it’s cheaper! To assemble the salad, here’s what to do. 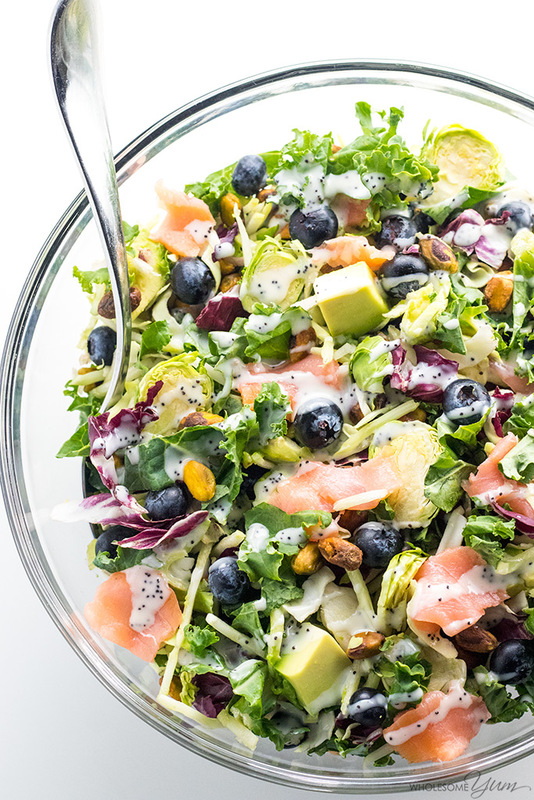 Toss your Costco salad mix (or homemade mix) into a large bowl, along with smoked salmon and fresh blueberries. Whisk together the dressing ingredients above, until it’s nice and smooth, then mix it into the salad. Finally, add the cubed avocado and pistachios last. That’s it! 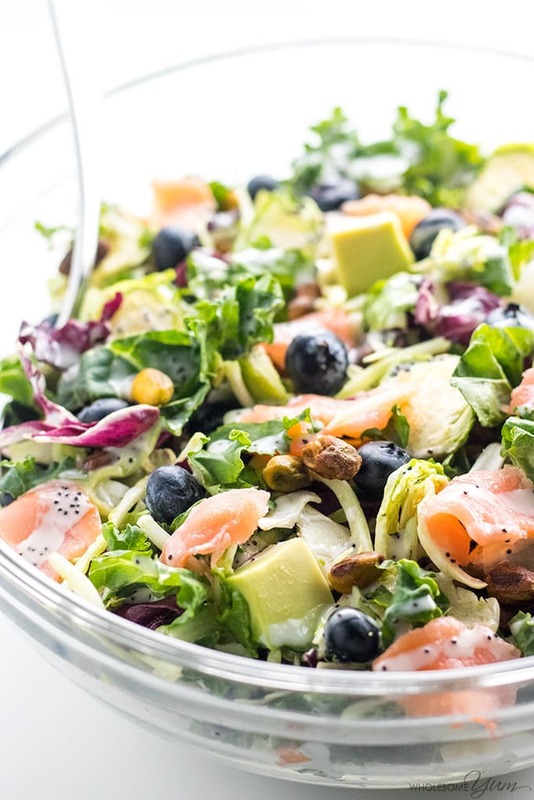 Good news – kale superfood salad with salmon and avocado is even better made ahead! All the greens in it are sturdy enough to handle it. And, they taste even more delicious when they sit with the dressing in the fridge for a while. I like to make the sweet kale salad a few hours before I need it, but more is totally fine. Unlike more delicate greens, it will even survive overnight without a problem! I have a baby kale avocado salad I love to make as well, but that doesn’t keep nearly as well as this one. If you want to make the superfood salad in advance, just mix up the dressing with the greens, salmon, and blueberries and leave it in the fridge. Add the avocado and pistachios last, right before serving. That way, the avocado won’t oxidize and the pistachios will stay crunchy. Even though this is a healthy superfood salad recipe, you might want to consider making it for Christmas, Hannukah, or whatever you are celebrating this week. Hey, even the holidays need some balance, right? Since it’s a great overnight salad (along with my favorite layered salad), it’s convenient to add it to your holiday table. No extra work required on the day-of! This is one of those salads that I make for any occasion. Holidays, healthy detox days, casual dinners, potlucks… it’s great for anything. 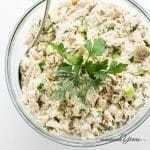 It’s my favorite smoked salmon salad recipe and my favorite superfood salad, too. If it’s not your thing for the holidays, make sure to save it for later! Come January, it will be your go-to detox superfood salad recipe. Once you try it, I think you’ll see why I think it’s the best kale salad ever. 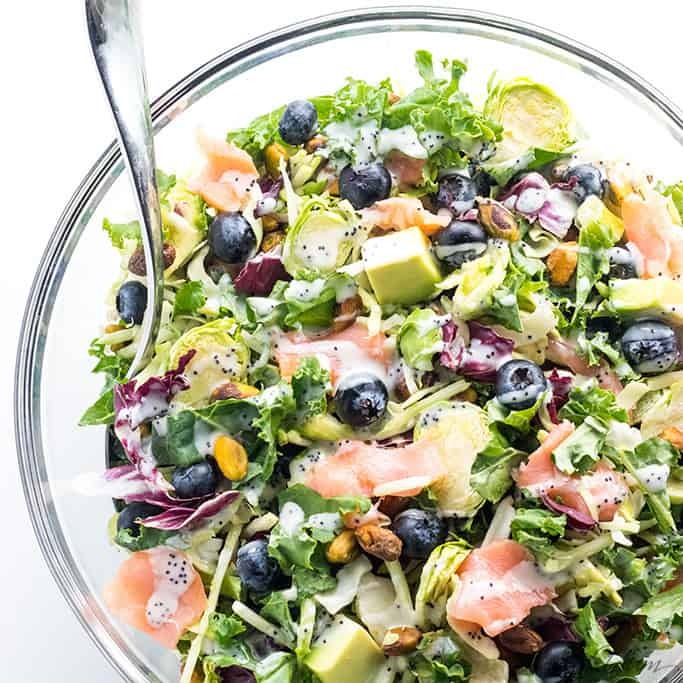 Combine Sweet Kale Salad mix, smoked salmon, and blueberries in a large bowl. Whisk together all dressing ingredients, until emulsified. Toss the dressing with the salad. Add the pistachios and cubed avocado, then toss again. I like to buy a Sweet Kale Salad Kit and remove the add-ins it comes with, but you can use any salad mix you like. You can also make your own by combining kale, green cabbage, broccoli, Brussels sprouts, and chicory. You can use any sweetener you like, but powdered or liquid works best. I recommend either powdered erythritol for sugar-free, or maple syrup or honey if not low carb. For even better flavor, make the salad ahead. Add the avocado and pistachios last, right before serving. Delicious! I had all the ingredients except pistachios so used pecans. Well, actually I didn’t have the salad mix, but kale and cabbage that I just cut up. Super easy and my husband loved it as well. 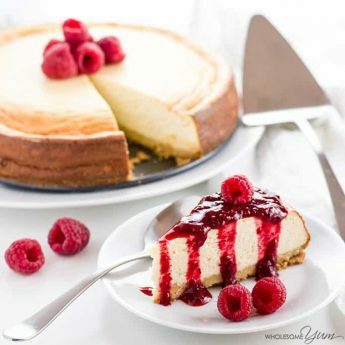 Thanks for this easy versatile recipe! I LOVE that Costco salad! 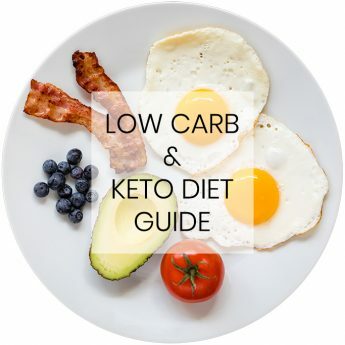 Thanks for letting me share this on Keen for Keto! WOW I made this last night for dinner and it was SO GOOD!!!! I will have to keep this recipe in rotation! I am so happy to hear that, Massie! Thank you! 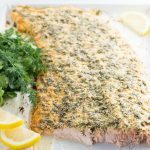 Your baked lemon herb Parmesan crusted salmon led me here! I always love to try any salad. Is it okay if I don’t add the pistachios? Hi Natalie, You can skip the pistachios if you want to. Or, you could use another type of nuts or seeds. 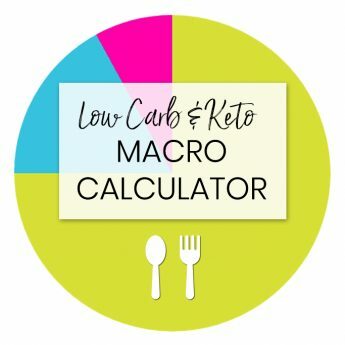 Not sure what you mean by the sushi but I do have a low carb sushi recipe here.